SOILx is an online interactive platform that provides geo-located information about different soil types and soil study sites across Canada. This platform is designed for desktop and mobile devices and it also includes an augmented reality interface, allowing users to find and learn about soil sites through their GPS-enabled smartphones or tablets. SOILx combines mobile technology and global positioning system (GPS) coordinates to connect virtual content (videos, graphics, text) to specific geographical locations. 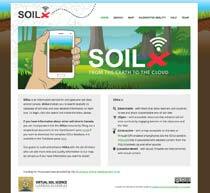 SOILx is ideal for education, particularly in field schools. It is also useful for land managers and people working in the natural resources sector. SOILs is built based on open source technologies such as WordPress, Wikitude, and Google Fusion Tables. Its data is also open to public and users who have information about other soil sites in Canada may submit their data to the SOILx resource, using a simple template which exists on the website. The data that is presented on SOILx are aggregated from a variety of sources including the existing learning modules by VSSLR.